Cold Nights in the Streets of Toronto – Ministering to the "ONE"
The staff of CDM Canada and leaders of Mission Volunteer Committee members, went out for a Toronto Street Mission Thursday night, Feb 09, since it was the coldest night of the year. A big thank you to all the volunteers and partners for your support! 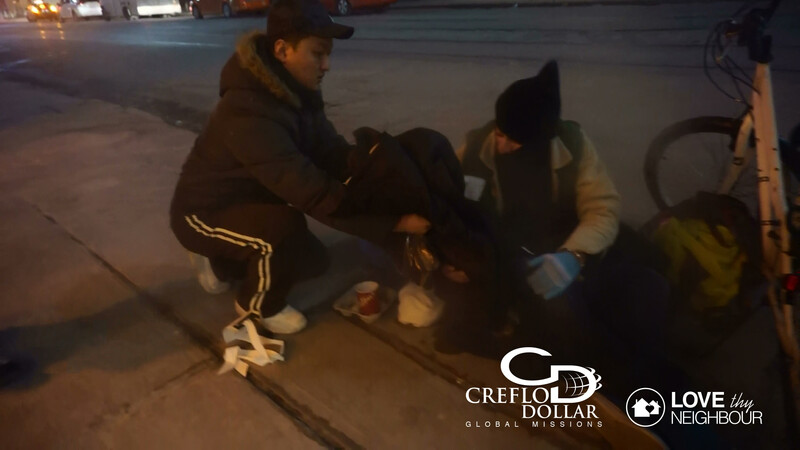 CDM Canada team went out to the streets of downtown Toronto on the night of January 04 when the “Extreme Cold Weather Alert” was issued by the government at -16 degree Celsius (3.2 degree Fahrenheit) for the first in the season. 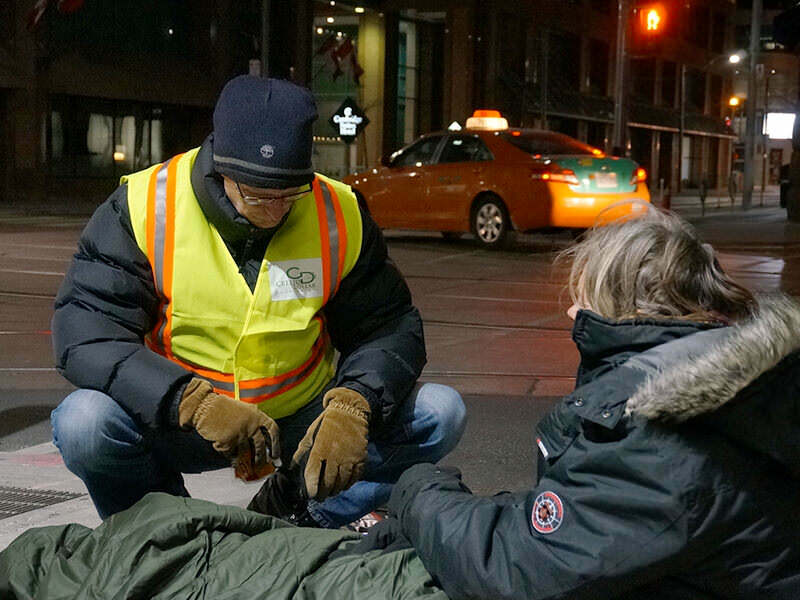 It was on the first day back to the office in 2016, but we couldn’t pass it by because last year two people died on the street when the first “Extreme Cold Weather Alert” was issued because street people were not prepared enough for the first cold night. 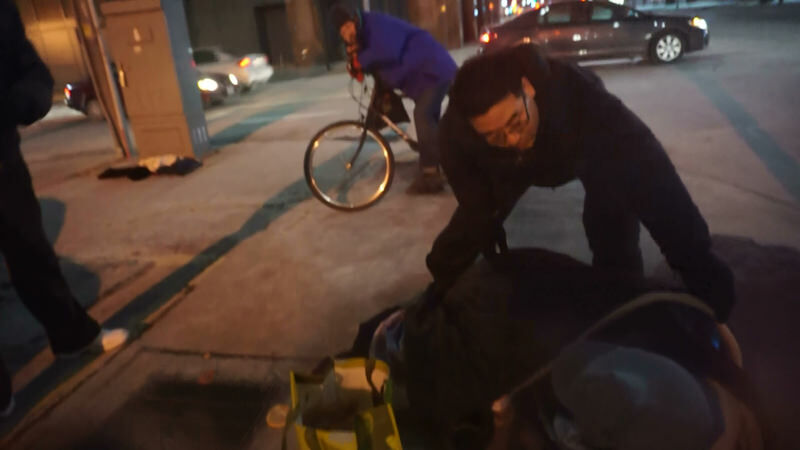 We encountered three people sleeping on the streets, two denied our offer, but one accepted. We used a couple of blankets and hats left over from the last season. We had back home at 1:00am. 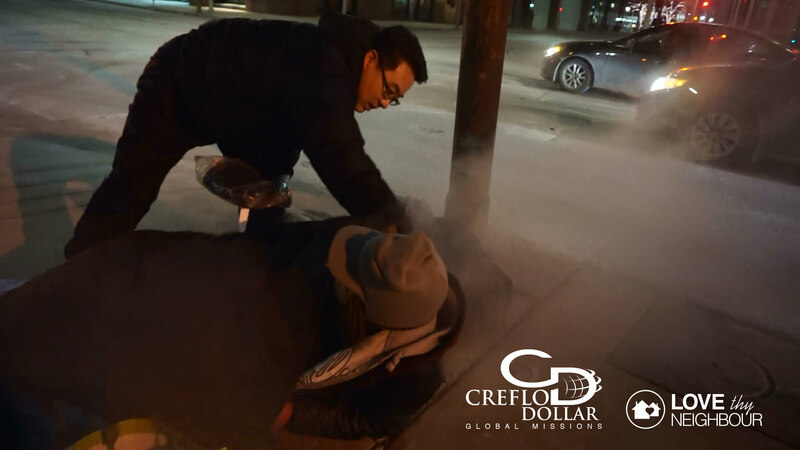 With temperatures reaching all time lows at -10 degrees in Toronto, Creflo Dollar Global Missions Canada is taking their local streets by storm. 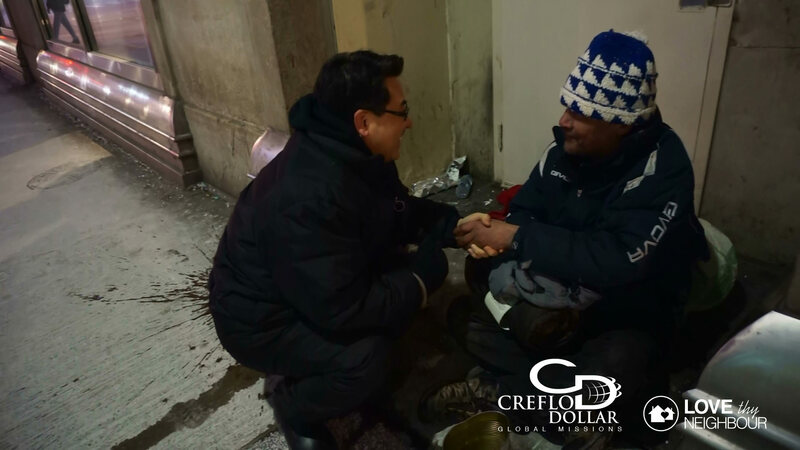 In the midst of the fierce winds, snow and rain they are spreading the love of God to the stranger in practical and effective ways. 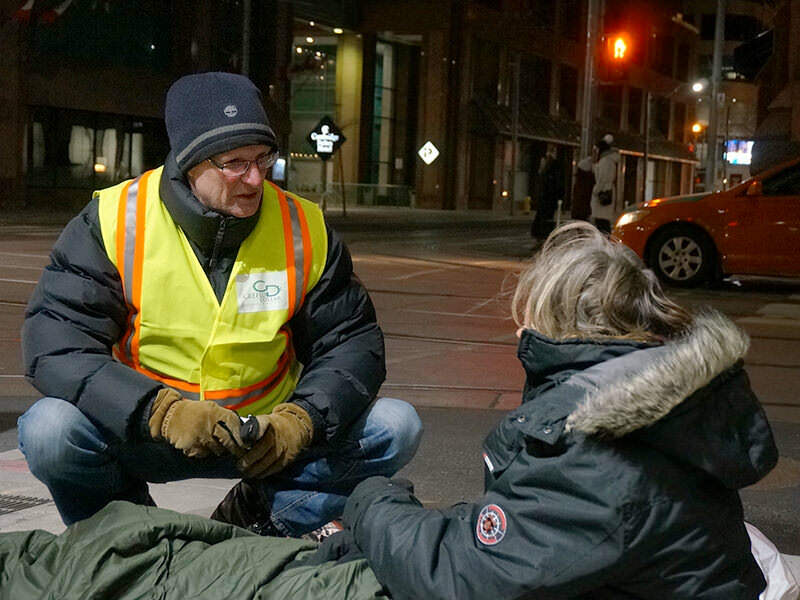 CDM Canada has deployed a team during late evenings over the course of the past few days. At the coldest peaks of the day they drive around in the snow-filled, and what appears to be, deserted streets searching for those in need of apparel to keep warm and survive the brutally cold nights. 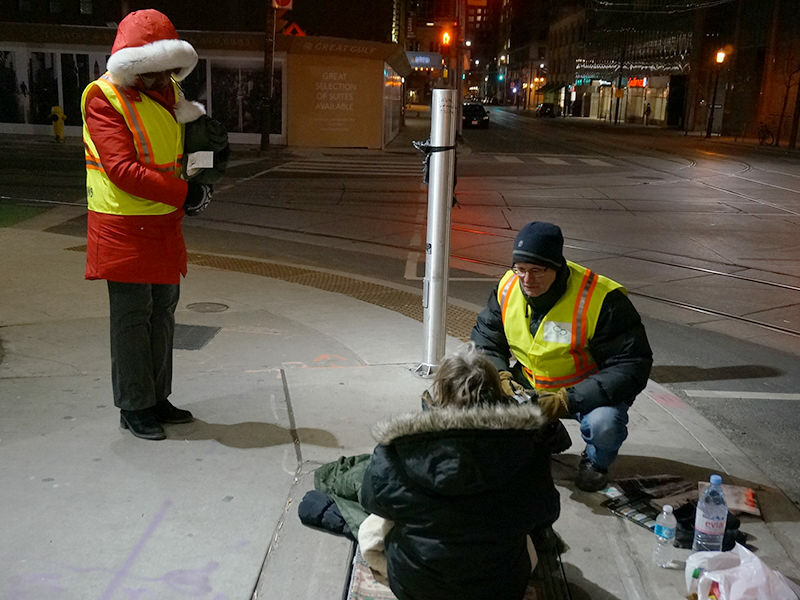 Along with handing out items like blankets and hats to those without shelter, they take the opportunity to share the gospel of grace at a time when it is needed most. 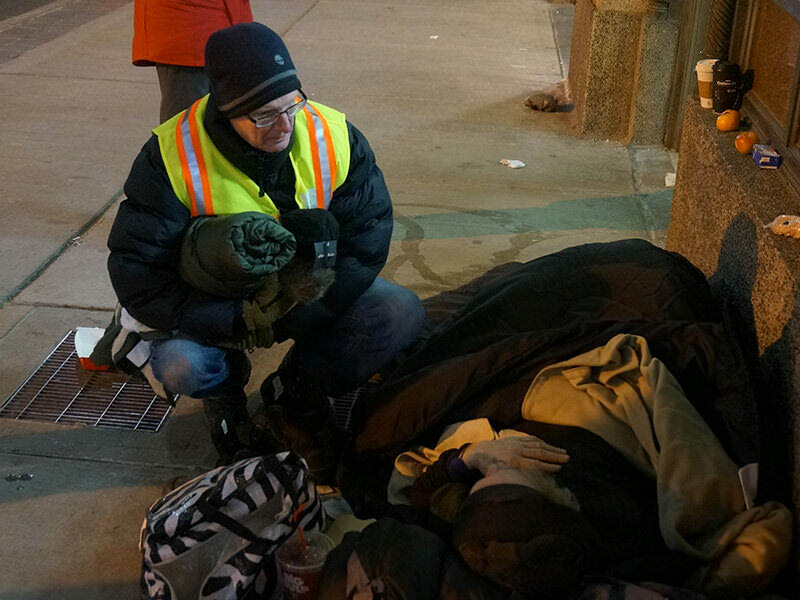 CDM Canada has distributed numerous blankets and hats over several days to the homeless. As the days pass, the reach and number of those being helped are steadily rising. This is our second night…on the streets. It’s Thursday and it’s midnight. 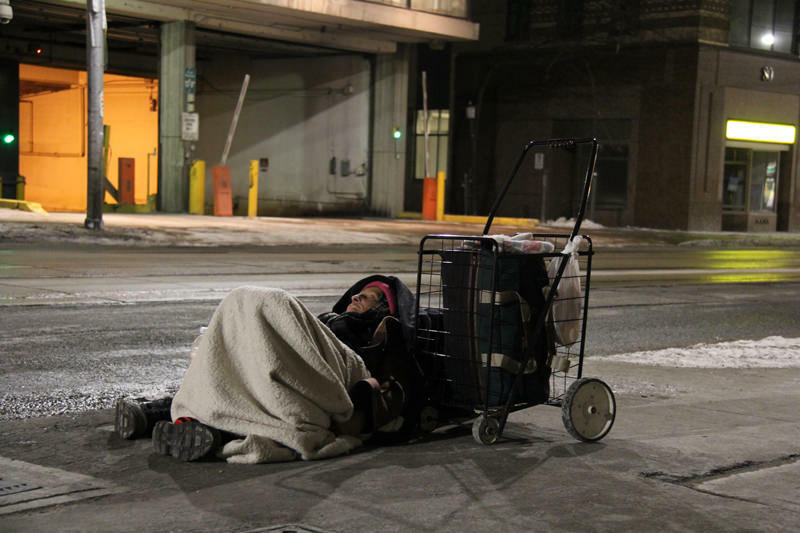 Again, another weather alert issued by Public Health Canada to Toronto to stay off the streets and keep warm. Whether you hear the alerts or not, your body temperature tells you - get inside; get warm! Some hear, some don’t. Some adhere, some don’t. Tonight it’s a combo package of fierce winds, snow and rain which makes it worse than last night. It is -10 degrees. Add to that the wind chill factor of -20 degrees. Feeling secure and warm in the van, we cruise along looking for those who are not. Our CDM Canada van is loaded with warm blankets and hats ready to find new owners. 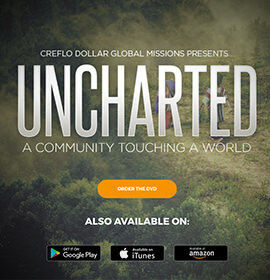 We journey along looking left and right, left and right – searching for anyone in need of help. But there’s nobody. It’s been fifty minutes of circling the city roads but not a homeless person in sight. Okay, they are all safe and warm inside - somewhere. We spin around and start heading back towards home. Suddenly, we caught sight of an old, tattered, scruffy, rumpled blanket someone seems to have tossed out in search of electrical warmth – inside somewhere. That’s good! I thought. No one in distress... just the fabric. But he insisted…my CDM support staff member, Caleb, insisted, “yes, YK, there IS someone nestled between the treads on the concrete, just under the display window of an up-for-rent, vacant office space.” Slowing down, my ‘sharp-shooting’ vision kept focus. My eyes know just how to focus – without flinching! I zeroed in on the blanket for any flicker of movement but nothing – only stillness that not even the wind seemed to disturb. We inched forward anyway to dispel our suspicion. Crouching over the blanket, I hollered: “Hello? Hello?” As close as I was, I saw no skin, no face, no movement. Then gently, we caught sight of peeping eyes through a carefully managed opening in the blanket. “Hello!” I said. But no sound came in response. “Have to call 911” I muttered, thinking this is a case that needs more than a blanket and a hat. So I called 311, the government help agency…the recording asked me to wait for an agent. I waited, waited, and waited –only silence!! I hung up, dialed 911….instant response, but what followed was a litany of questions for me to answer. ‘Is he sleeping? Is he dead? Is he breathing?’ I checked his breathing and it was OK. More questions: “Does he need an ambulance? Does he need shelter? Does he need hospital care?” In Canada, the answers to these questions are generated only by the Subject himself. He chooses to accept or reject help and that decision must be respected. “If he chooses not to go”, says 911, “we cannot force him”. By this time, hearing all the conversation, the individual rises from the concrete and sits up. So, I fetch the blanket and hat from the van. He’s used to sleeping out in the cold, he tells us. He spends every night on the cold concrete and has been doing so for two years. He is also determined to continue doing so until his plans are realized. He has a deal with his bank – they will work with him to save enough money to secure his first and last months’ rent so he can find a place and pay his prospective landlord. He has been on a government waiting list for government housing and has been waiting but no help has been forthcoming. “You remind me of Jackie” he says, “Jackie Chan”. We laugh together. “He’s a good man”, he says smiling. By this time, we are finding trust in each other. So now he confides in me: “My son is a police officer; he’s in the USA. My ex-wife is also a cop. I don’t want her to know I’m here. I’ll only be here a little while longer on the streets.”, he assures me. “I only need to save enough for my first and last months’ rent.” “Keep warm”, I keep telling him. As I prepare to leave, he addesses me: ”Jackie, thank you very much!! I will do same to others later”. Before I left, I handed him one of our CDM booklets. He brandished his newly acquired eyeglasses. “I just got them. I need them so I can read while I’m here”. With the voice of wisdom, he states: “God gives you vision to do greater things in time to come”. As I saunter off, he petitions me “if you see the real Jackie, say ‘Hi’ for me”. We laughed. We shook hands. We gained each other’s trust. What a blessed encounter! 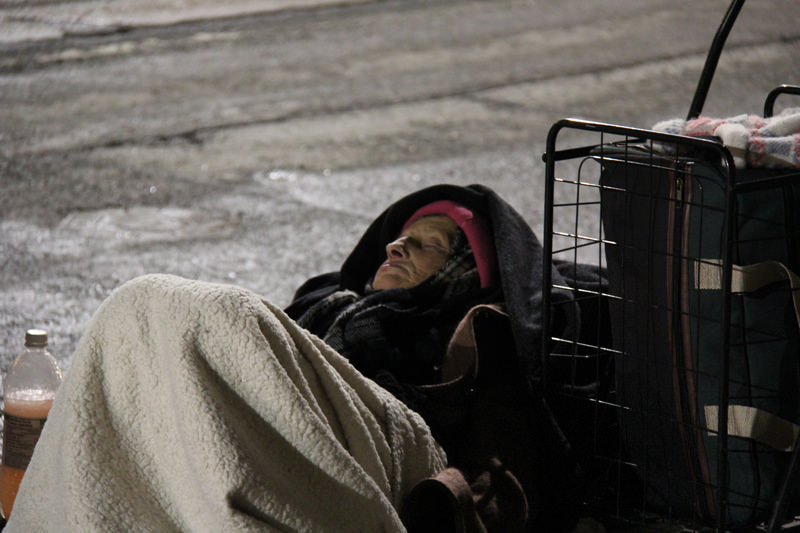 Tonight our ‘friend’ may be living on the outside, cold, but unashamed. What I saw was a man of dignity; a man with a clear and well-defined goal. 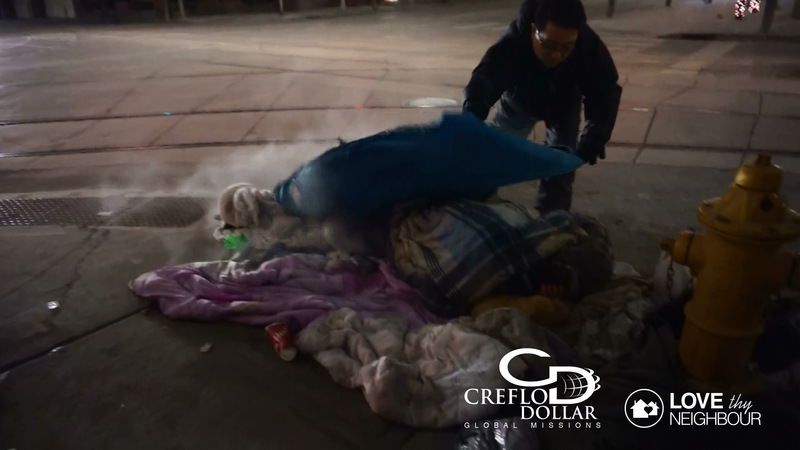 With the help of CDM Canada he will be able to endure the winter, stay warm, and most importantly, remain alive. He will know that there is someone who cares, so that in the near future, like many others, he too will be warm on the inside and well ‘blanketed’ along with the memory of CDM Canada recorded as part of his path that led to his transformation and change which we pray for. It’s the third night and we’re back on the trail. It’s only a few minutes away from midnight on Friday, January 16. It was below freezing temperatures outside…wind chill of -30 degrees, in fact. This is the first Friday we’ve ventured out. It’s deliberate. No need for an early morning wake-up for the team to get back to work on time next day. The streets are also busier on Friday nights. We staged our visit for midnight because we understand that those who will go to the shelters must be there before midnight. So we go for those who will not make it to the shelter. We also know that they will be in clear view on the streets. 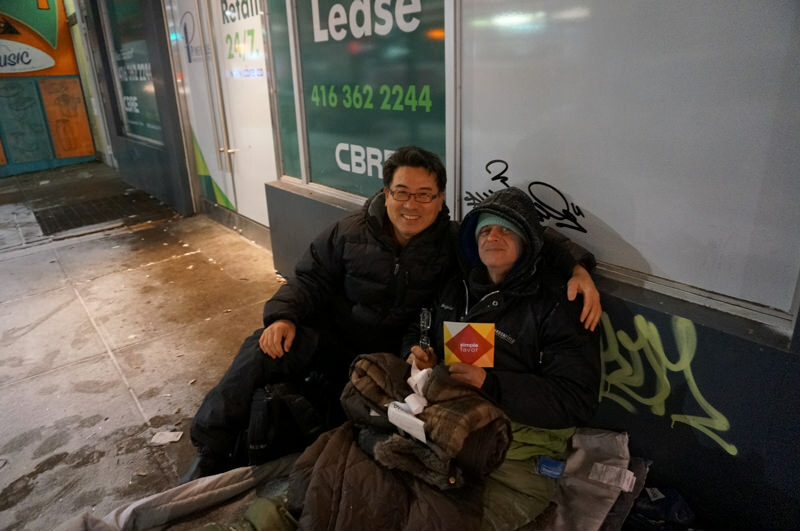 Our first encounter was a man stubbornly determined to endure the bone-chilling cold rather than be exposed to the “shelter bed bugs”. We offered him a blanket and he took it. Beside him, on the opposite side of the roadway’s steam vent, about 10 inches away, a female totally consumed with sleep; a thin cover blanketing her. “Is she your friend? Should we give her a blanket?” we asked him. “Yes”, he said, “Wrap her up. Throw it on her”. We blanketed her. We tucked her in. She finally raised her head, opened the lense of her eyes and mumbled: “Thank you”. As we walked off, something in our hearts prompted us to turn back. So we turned back, pulled out a head covering, and crowned her head with enough warmth to keep her throughout the night. Did they make it to morning? We didn’t know. But our prayer and conviction is that, since we went in the Name of The Lord Jesus, we expect that His Spirit working with us would care for those we leave behind. Further on, we saw what looked like a huge, blue, inflated body bag. Surely someone was encased inside. The only assertion was that it was ALIVE. There was no face to look at; no eyes to penetrate, and no mouth to communicate with us...everything tightly locked up. So again we moved on. Before we left, we encountered one man lying on the street with barely any cover except for his jacket, who, upon the sound of our voices, sprung up from the ground with such enthusiasm. We were happy to discover he was alive. We gave him a blanket, spoke a short while and parted company. We left the streets of Toronto that night, knowing that we tried. That was the silent message posted by her “bedside”, close enough to her resting head, when we stopped by to offer help. 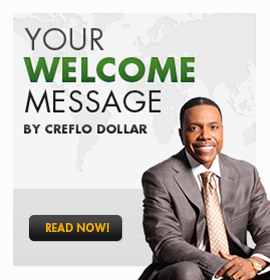 The message was loud and unmistakable. We found her nestled between two giant posts similar to those we see of Solomon’s temple...the only difference was, her giant posts were constructed so close to each other, they provided just enough length to fit her in, from head to toes. Was that symbolic of her strength? Somewhat. Our insistence to help her was met with even greater resistance, though politely. She didn’t need our blanket. She didn’t need our cap. All she needed was her dog, submerged under the blankets with her, and her space. And based on her personal billboard planted by her head, she needed tolerance and money. We had the tolerance and we gave it; we had the money but we didn’t! So we moved on. As we looked around, life on the city streets was vibrant. Taxis zooming by, private cars moving at bullet-speed, bicycle riders cruising along… Everyone on their own agenda, working in rhythm with the music filtering the night air. But no one seemed to care about who’s sleeping on the street and who’s not. Who’s in need of help, and who’s not. But because our agenda was the street sleepers and those in need of help, we kept on marching. We found her…an old, frail, weak woman struggling to make her way along and find a resting place. Our hearts went out to her. We chatted with her. We gave her a blanket. She didn’t want much. She already had her whole world stuffed in a square, metal shopping cart, which she barely managed to pull around with her. How much longer could she handle the trek? Only God knows. Condition: Snowed for the past few days. Wet Streets. 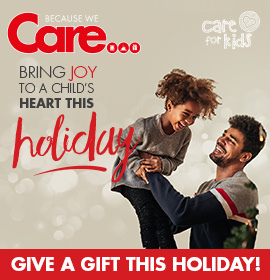 Give out material: 1 Blanket, personal $5. In the Scriptures, the number FIVE is synonymous with Mercy. Tonight, we’ve loaded up our hearts and our van with mercy for our ‘neighbours’ on the streets. This is night number FIVE on Toronto’s snow-coated streets. Another extremely cold, winter night. Again, our hope and expectation was that there would be no one using the sky as a ceiling, and the concrete for a bed. So we bolted out of the van and steeled ourselves to endure the cold. We hadn’t walked too far when we saw her. We actually found her again! We couldn’t believe it. The lone woman, seemingly frail but stubborn. When we saw her on night 4, we weren’t sure she’d pull through the fierce, frigid temperatures of the night. Can you believe it? We couldn’t. Goes to show, our God knows. This time, she wasn’t lugging her worldly goods around, she was lying prostrate on her back, nose touching the sky; down but not out; covered all around except for her beautiful face with cherry red cheeks. In that intensity of sleep, one dreams. What was hers? Swirling around her was the mighty rush of wind, wheels and watery streets. Her body was there, but her mind elsewhere. We dared not wake her. That serenity must feel somewhat like Heaven. Was she cold? Of course not! 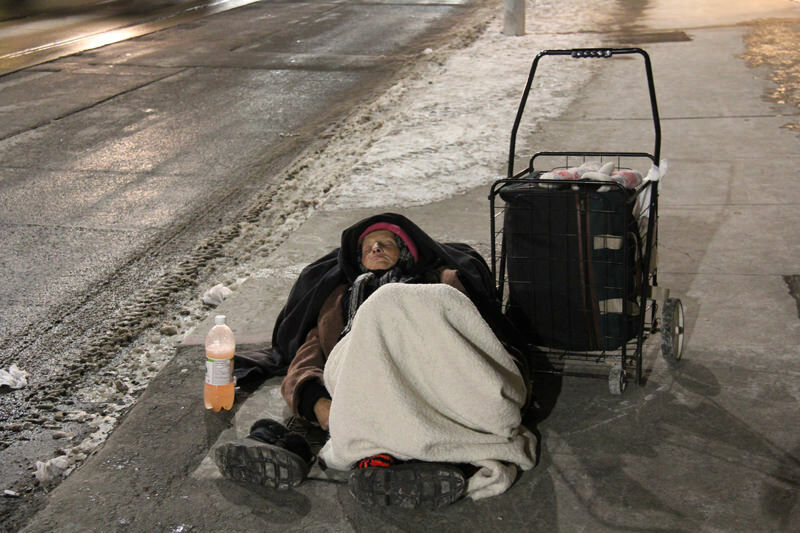 Layered in blankets and everything else, she had her own personal road-installed heater radiating temperatures conducive to a comfortable night’s rest. We left with the satisfaction that the angels are surrounding her. When we first met her, we gave her what we had. The Bible says, one plants, the other waters, and God gives the increase. Not sure if we did the planting or the watering, but for sure, God will give her the increase she needs to carry on. 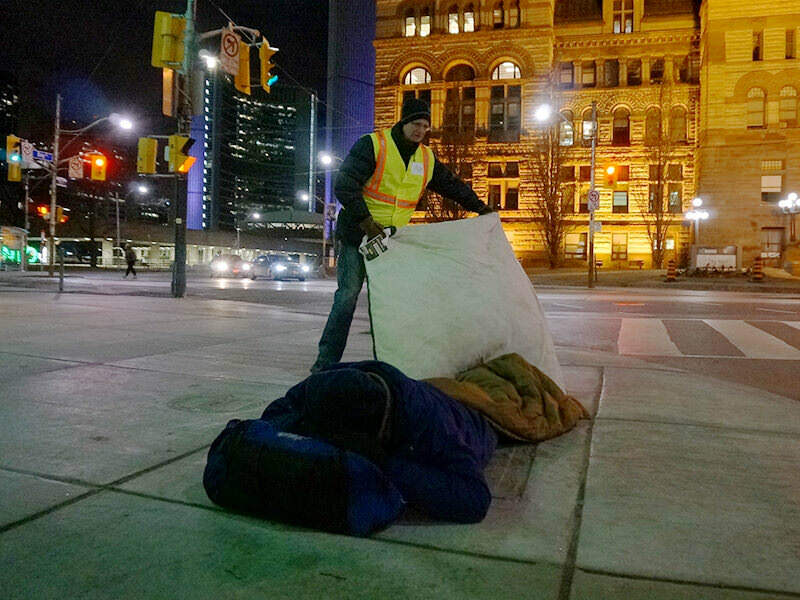 Did we say this was a “cold night” on the streets of Toronto? Really, what we meant was, a freezing, icy, bone-chilling, freeze-on-contact night. A night where everything that’s fluid, freezes. Everything, including nasal mucus! We saw it with our own eyes…what was running down out of the nostril, froze before it could fall to ground. 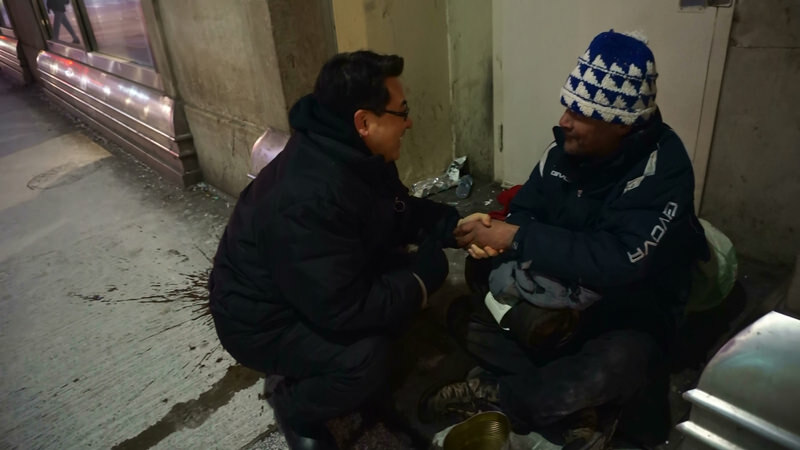 We encouraged him to receive a warm blanket from us, but he refused at first. His legs were shaking. His shoulders crunched up, to lock in the body warmth. He could barely speak – too cold to speak. Like Peter in The Scriptures, we wanted him to know that we did not come bringing “Silver and gold…. but what we do have, we want to give him: In the name of Jesus Christ of Nazareth, we wanted him to rise up and walk in the comfort and provisions of Christ.” He eventually accepted. 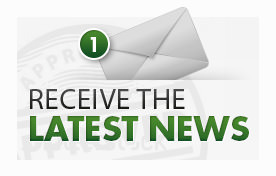 Condition: Extreme Cold Weather alert in effect – Extremely cold and windy. Lord, when did we see You naked and clothe you? When did we see You hungry and feed you? 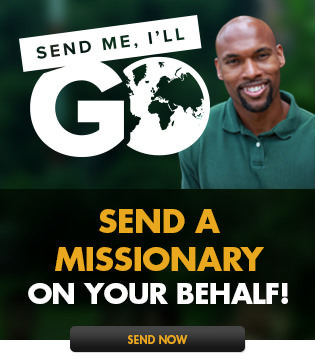 His response: The least that you do for these my children, you do it unto Me! Night 6 broke the record in Toronto - temperature records, that is. It earned the reputation of being the coldest night of the season at -23 degrees with wind chill of -29. That is considered freezing point. When the road surface is pearly white like the insides of a freezer, it’s an indication that the road is frozen. And it was. So we hit the gas pedals in the van and rolled our way down Toronto’s busiest street. As always, our expectation and hope was that there would be no one using the concrete as a bed. Please Lord, not tonight. Nevertheless, we went, just in case. We patrolled the streets armed with one thing – Grace, God’s Grace. After one hour of patrolling, we found nobody walking, nobody panhandling, and nobody sleeping. It’s now near 12:00am. We had traversed our usual route. We circled other streets and found nobody. Satisfied and relieved, we turned around and headed back towards home. 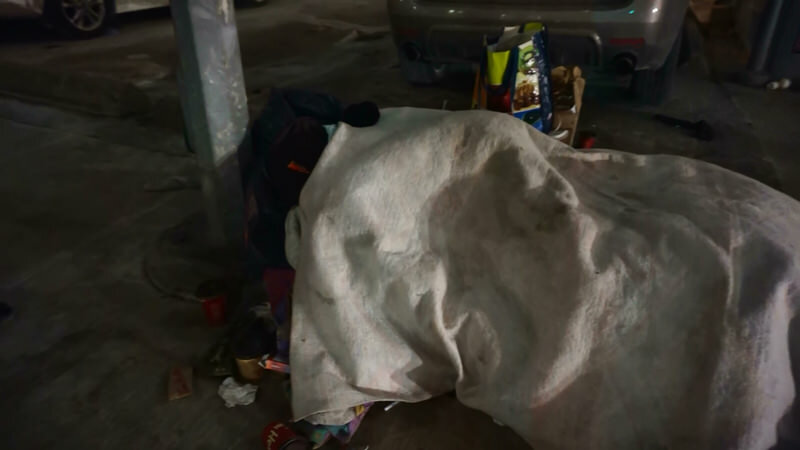 But we had become so sensitized to the behaviour of street sleepers that we knew that where there was anything looking like disposed blankets or comforters, it’s a sign to stop and check. And we did. There was a pile of thin comforters neatly spread out close to the steam holes on the road side - another sign that life was probably wrapped underneath. Lord, is there a human here? Our eyes doubted, but our hearts wanted to be sure. Like a rescue team, we bolted out of the van, advanced towards the coverings, lifted the covering…all we could see was his head, a twitching, moving head. Thank You Jesus- movement means life. That means he’s alive. Rather than waking him, we covered him with Grace – God’s Grace. Rather than questioning him, we prayed for him and left a gospel message booklet. We prayed that he would survive the night and forever. We spent 5 minutes in the open air to help cover him – in those 5 minutes, our cheeks were very close to being frozen…one more minute, and we’d have been frost bitten. “Lord!, help him make it through the night” (that was our departing prayer). The world is made up of different kinds of people; so are the streets and the people we find on them. Some people can handle the cold, and some can’t; some like the cold, and some don’t. Some are tenacious, some aren’t. 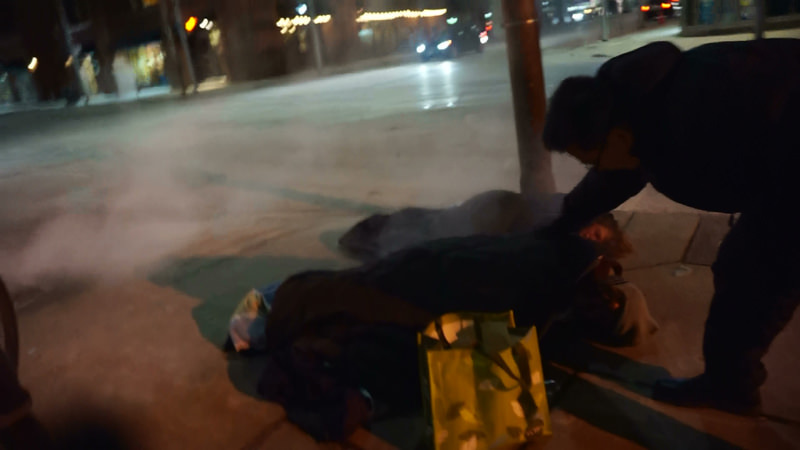 This is Night 7 on Toronto’s ‘breathe-or-you-freeze’ streets. Like soldiers in the army of God, armed and equipped, we alighted from our command post and marched towards the narrow outdoor corridors, with one guarantee from our Commander in Chief -“No Mission is impossible”. With that heart-bursting assurance, we charged forward, sniffing out the streets with our eyes. Yes, we’re more experienced now, we know what to look for and we know it when we see it. On the left side of the street as we patrol along, the sign reads ‘No Parking’ – but that message is for machines, not men. In the air, a mix of familiar sounds that alert you with the non-verbal message - ‘caution!’ There are sirens, bike engines, alarms and train whistles – all machines shooting warning signals in the air as if working with us to alert outdoor sleepers of the potential risks. Unlike civilians, soldiers are trained and sense danger immediately. So we kept up our patrol. 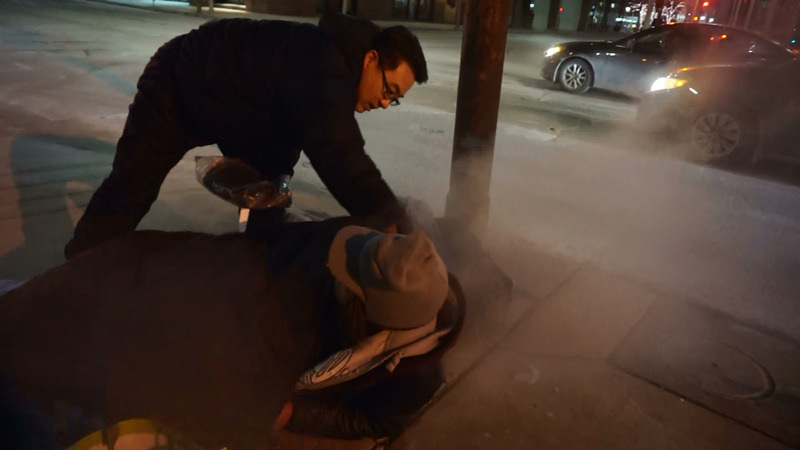 Then we discovered that tonight’s temperature of -35 degrees did not intimidate the sole sleeper we found outside – smoke almost surrounding him. He’s trying to make his way to Sudbury, a few kilometers from Toronto. He’s covered in a wet blanket; wet from the steam emanating from the steam hole underneath him. We offer him warmth, we offer him covering…but his mind is set on Sudbury and finding the means to get there! But soldiers don’t travel with pockets, they travel with survival-supplies. So, Sudbury was not on our mind. Not tonight. All we wanted was to provide the ‘life support’ we brought him, bundled and tied with GRACE. He took it, eventually. We wrapped him, bundled him up and left a small message with him. “Survive man!” we begged him. We returned to our bunkers and we sensed the assurance in our spirits: MISSION ACCOMPLISHED!